An HIV test detects HIV infection indirectly using an ELISA test against HIV antibodies in the blood. 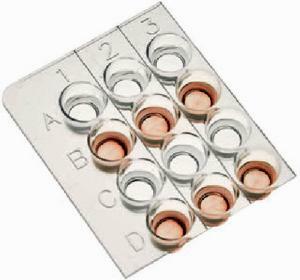 The test works by taking antibodies from the patient's blood and adding them to a micro titer plate coated with HIV antigen. If HIV antibodies are present in the blood, they will bind to the antigens on the plate. This binding is detected with an enzyme-linked secondary antibody that causes a color change upon addition of substrate. In this experiment, your students will perform an ELISA test by coating micro titer plate wells with simulated HIV antigen and then test simulated donor serum for anti-HIV antibodies. Kit includes: instructions, simulated HIV antigens, serum samples, antibodies, buffers, micro titer plates, assorted pipettes and microtest tubes. Required, but not included: 37°C incubation oven, micropipettes with tips (optional), pipette pumps, laboratory glassware, distilled or deionized water.